The world of American foxhunting lost one of its best-loved and most highly respected personalities with the passing of huntsman Melvin Poe on Saturday September 13, 2014. That’s the sad news. The good news is that Melvin was able to ride his horse and hunt his hounds to the very last year of his life. In foxhunting circles he was referred to simply as Melvin. Everyone knew who you were talking about. He’s been a fixture in North American foxhunting for more than sixty years and a celebrated legend for most of that time. He’s immortalized in a dramatic oil painting by Wally Nall; he made the cover of UK’s Horse and Hound in 1991; he starred in Tom Davenport’s 1979 foxhunting video documentary, ‘Thoughts on Foxhunting’, narrated by Alexander Mackay-Smith; he was the subject for Peter Winant’s wonderful book, ‘Foxhunting with Melvin Poe’, The Derrydale Press 2002; and Melvin was inducted, along with his brother Albert, into the Huntsman’s Room at the Museum of Hounds and Hunting in Leesburg, Virginia. Melvin grew up in the Virginia countryside. He was the boy to whom his friends turned to identify trees, birds, and animal tracks. His father, uncles, and brothers were all enthusiastic hound breeders and hunters. Melvin and his contemporaries represent a vanishing breed of countryman who knew the woodlands intimately and all the creatures therein. And baseball! Melvin and his brothers loved baseball and participated in organized league play into their adult years. Born in Fauquier County, Virginia—the Old Dominion Hounds hunting country—Melvin lived there, except for a stint in the Army during World War II, throughout his entire life. In the Army he served as a Jeep mechanic and participated in the invasion of Normandy. Upon resuming civilian life, he missed out on a job as an auto mechanic and was hired instead by the Old Dominion Hounds, where he served as professional huntsman from 1948 to 1959 and for the 1961–1962 season. 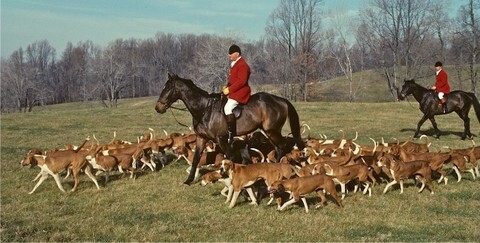 In 1964, he became the professional huntsman for the Orange County Hunt (VA) and continued in that role until 1991. The Orange County pack of red ring-necked American hounds has long been one of North America’s premier packs, and a day in their superb hunting country south of Middleburg was always highly sought after by visiting sportsmen and women on both sides of the Atlantic. 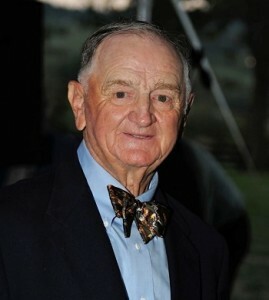 Melvin showed the best of sport and the best of humor to the famous, like Jacqueline Kennedy Onassis and Senator John Warner, to visiting sportsmen and women from all over the world, and to everyday foxhunters like me. He never scolded the field for turning a fox or foiling a line. “If my hounds can’t recover a line that’s been spoiled, the fault is mine,” he maintained. I certainly remember many great runs when visiting the Orange County, but what stands out most in my mind is how Melvin’s hounds adored him. We’ve all seen huntsmen hustle their hounds back onto the hound truck after a hunt, the theory being: capture them while they’re still here. Not so, Melvin. After hunts at the Orange County, he just allowed hounds to hang out. They weren’t about to leave; they were where they wanted to be—with him. The door to the hound truck would remain open while Melvin offered his homemade wine to the foxhunters. Some hounds would climb in; others would lie on the ramp or at his feet outside. They were relaxed and happy, and, if they weren’t snoozing, their eyes followed his every move in complete adoration. That wasn’t training. No one, not even Melvin, can ‘train’ hounds to do that. That connection is made from somewhere deep inside. After his retirement from Orange County, Melvin was pretty unhappy. Even his wife, Peggy, declared him to be more like a foxhound than any other creature. The former long-time chairman of the Orange County Hunt, the late George L. Ohrstrom, Jr. had the answer. Mr. Ohrstrom owned a farm, Fassifern, deep in the Allegheny Mountains of Virginia, in the town of Warm Springs, Bath County. Mr. Ohrstrom realized that he was in a position to provide a new purpose for Melvin, so in 1992 he established his private pack, the Bath County Hounds. For more than fifteen years, Melvin, and the Bath County Hounds showed a unique style of sport and hospitality to foxhunting guests in an old-fashioned American way. He always wanted the field close behind him, so they could see the action. I remember a reliable covert on a plateau above an old factory in Bath County where he would hold up his hounds and, like a symphony conductor, position the field in the best place to view the fox away. Melvin continued to hunt his hounds from his home in Hume, Virginia, accompanied by relatives, neighbors, and friends almost to his very last days. He has given advice and assistance on hounds and hunting whenever requested to hunts all over the country, from Misty Morning Hounds in Florida to the Long Lake Hounds in Minnesota. With Melvin Poe gone, a big empty space is left in America’s foxhunting world.